This is where it all comes together: The beautifully designed homes featuring every modern convenience, the inspiring surroundings you will enjoy, and the diverse people you will meet. Here, they combine with the best schools, schools that will challenge your young ones as they grow and learn. Beyond that, the city—thriving with culture, art, shopping, and dining. At the very center of it all, your community—the people and experiences that make Woodson’s Reserve different. This is what you’ll be a part of when you call Woodson’s Reserve home. 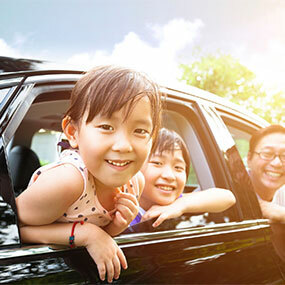 Your children’s weekday will be filled with interesting, challenging schoolwork, and weekends are full of fun with family, whether at the pool or visiting the city. A future on-site Grand Oaks High School and intermediate school will be bringing an A+ education closer to home in fall 2018. At Woodson’s Reserve, you’ll never be inconvenienced by location, or feel you’re missing out on what the city has to offer. Enjoy quick access to major transportation corridors, including I-45, Hardy Toll Road, and U.S. 59. Leave inconvenience behind—far behind. Our on-site lifestyle directors are here to help you and your family make the most of our state-of-the-art grounds and facilities. Their background in planning team-building activities and fun-filled events means they are perfect to help us build out our event calendar at Woodson’s Reserve. At Woodson's Reserve, you're surrounded by endless plans for fun outdoors and memories to be shared with neighbors and family. As our community grows, we always have exciting events for everyone to enjoy. One of our Lifestyle Directors will be in touch with you shortly to schedule your tour. Find a new level of relaxation in your home—a modern lifestyle full of opportunities for fun, right outside your front door. 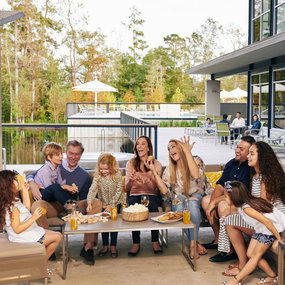 Add easy access to the Grand Parkway, and you’ll soon find that this luxurious lifestyle keeps you connected to everything that matters most: The best homes. The finest community. And the entire city, moments away. Who could ask for more? But at Woodson’s Reserve, you always get more. Here, you’ll reconnect with what’s important. Maybe that’s the nature that surrounds you, or the friends and family you live among. It might mean taking advantage of the opportunities to exercise your mind and body, or simply to create a home that reflects your personality. Whatever is important to you, Woodson’s Reserve helps you stay connected. Woodson’s Reserve was built to be a uniquely contemporary community—that means that homes are eminently suited to your needs, and that your neighbors are a cross-section of our city, the most diverse in the nation. With that being said, your days are filled with possibilities—to have real experiences with the real people that make up your community. It’s a different, more authentic way of life. Home is the place you feel most like yourself. At Woodson’s Reserve, you’ll feel like the best version of yourself—as you’re reinvigorated by nature, you’ll find it easier to leave stress and worry behind. You’re surrounded by the latest in modern convenience, and able to reconnect with the outdoors. Here, you can truly enjoy both the simple and luxurious things that life has to offer.